In this effect a selected card is placed into the deck of cards. The selected card is seen to gradually rise from the deck. Break a rubherband forming a single strand. Attach this at the top between two cards. The best way is to thread them to a hole in each card and place a knot at each end Figure 79. Place these prepared cards in the middle of the deck. Force a card and then replace it in between this gimmick Figure 80. Holding the deck lightly you release the pressure on the deck and the card will magically rise. This effect may be accomplished with unprepared cards. 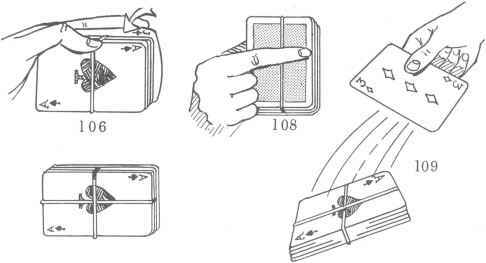 As your spectator selects one card and notes it the performer turns aside and encircles the entire deck with a rubber band, vertically. Chosen card is forced flush into the center of the deck, pushing down the elastic band which is masked by the thumb and fingers of the performers hand. As the thumb releases its pressure gradually 011 the deck, the card will slowly raise from the deck. The card can be made to jump out of the deck by releasing the thumb quickly. To make a smaller object like a ring or a coin disappear. Take a ring from someone in the audience and place it in your left hand. Tell your spectator to cover it with a handkerchief over your left hand. Your right hand should direct the action (this is important). 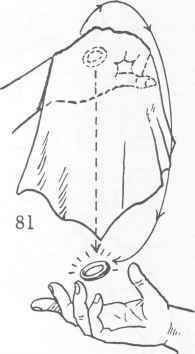 Turn over the left hand underneath the handkerchief with the palm still closed over the ring face down. Tell the spectator to put the rubberband around the left hand still holding the ring. At this point you indicate with the right hand and gesture with a circle around the handkerchief, showing the person how to put the rubberband around the left hand embracing the lefl »and covered hv the handkerchief holding the ring, As your right hand comes to the bottom of the handkerchief you open your left hand which is face down and drop the ring into the right hand completing the circle figure 81. You bring your right hand unnoticed to the side of your body. After the rubberband has been placed by the spectator on the left hand covering the handkerchief and hand which is supposed to contain the ring you extend both arms to the side far apart and with some magical action or gesture you now have them take off the handkerchief and they will find that the ring has magically transferred from the left hand to the right. EFFECT: A ring made out of ordinary nililwt'' band and turned around the performer's forefingers,% both thumbs and forefingers of the performer's hands are put together, and the ring is made to fall in a mysterious manner Figure 82. 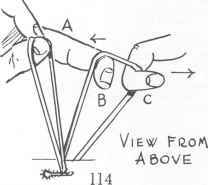 EXPLANATION: After the rubber band is turned around, the performer places his thumbs and forefingers in the position as shown in Figure 83. It is quite a simple matter for the band to fall when the conjuror o|>ens his fingers but not separating them. See Figures 81 and 85. Use a large thick dark rubberband cut in half to a single strand. Ask the child if they like to go fishing and if they have any worms. Tell them you have a special worm you would like to show them. You place part of the rubberband on the back of your hand and it will crawl and disappear like a worm. THE METHOD: Wrap about one quarter of the rubberband around the bottom of your little finger as in Figure 86. Pull the rest of the rubberband taut. Grasp the lower part of the rubberband between the thumb and index finger while it is still taut. As you place the rubberband on the back of the hand gradually relax the grip between the thumb and index finger as in Figure 87. The rubberband will crawl back into your closed hand while it is held with the fingers down. This effect can be made more exciting by painting an eye and mouth on the thick rubberband with white ink. That prolific inventor and dealer in things magical came up with this one — It is to be found in his "The encyclopedia of U. F. GRANT MAGIC." The effect is that a spectator thoroughly shuffles the deck and cuts it into two halves. He gives you either half. Performer turns his back, while spectator removes any card from his half and after remembering it places it face down on the table. Each half is encircled with a rubber band. The two halves, thus banded are placed together and the chosen card is placed between both halves of the deck. On opening the deck, the chosen card is seen to have vanished. Performer again closes the two packs together and tosses them on the table. The selected card jumps right out of the deck. For this effect you will need two rubber bands just long enough to fit around each half of the deck across their widths, snugly. Spectator shuffles the deck and cuts it into two equal packets. He encircles each half with a rubber band Figure 88 and gives either half to the performer. He then withdraws one card from his packet and places it face down on the table. In the meantime the performer turns his back and lifts three or four cards from his half as in Figure 89. 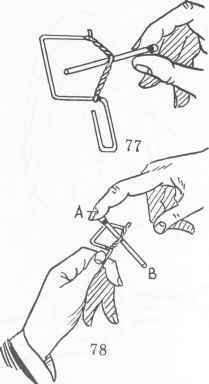 The magician then twists his top smaller packet so that an x is formed as in Figure 90 and then places the two portions of the packet together lining up the rubber band on the sides and holding his thumb over the edge. Have the spectator place his banded 'packet on top of yours. You then inquire if he remembers his card. Open the deck book wise but raise up the spectator's packet and the three or four cards which are on top of your packet Figure 91. Place selected card at point x Figure 91. Apparently his selected card has vanished. Close the deck and throw it on the table. The two halves of the deck will revolve and the chosen card will be propelled from the deck Figure 92. Loop the rubber band around your left thumb and stretch it away from you Figure 93. Now twist it once Figure 94. Her comes the tricky part. Press the rubber band against your thumb using your left middle finger so that the twist stays in Figure 95. Now twist the rubber band in the opposite direction so that one twist cancels the other, Figure 96. Now pull the looped end towards you over the top of your thumb Figure 97. It apparently looks like the rubber band is tied on but when you release your middle finger the rubber band automatically penetrates your thumb Figure 98. This is equally effective using a pencil instead of your thumb. We are indebted to the late Al Baker for this beautiful effect. A card is selected by spectator and brought to top of deck by pass or Hindu Shuffle. The deck of cards is held in the left hand, facing your audience. A rubber band is slipped over the right finger. Fig. 99 (audience view). Under cover of the right hand slide top (selected) card to the right. As the right hand masks it you can easily encircle the deck along the width with a rubber band except for the top card which is left free above the elastic, Fig. 100. With your left thumb divide the deck in half along its left long edge. Open the deck bookwise with the left thumb and revolve the lower half, around right long edge, to back of deck squaring it up over chosen card, Fig. 101. Place this deck on table holding it securely with your right index finger. Release this finger and the card will shoot right out of the deck, Fig. 102. For this effect you will need a long flexible elastic band, approximately 6 to 8 inches in length. Stretch it over the backs of each hand at the finger tips, as in figure 103. 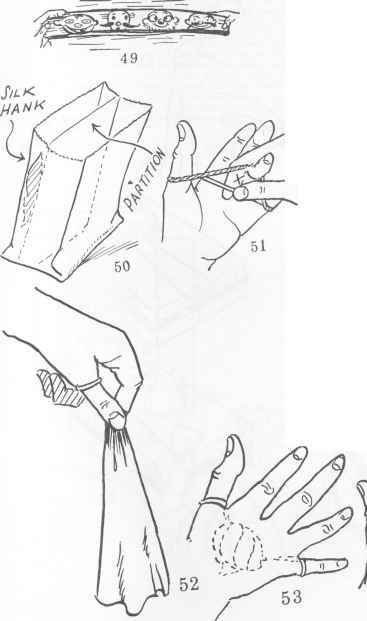 Interlock all fingers, alternately hooking both strands with the finger tips. See Fig. 104. Pull your hands apart in the directions of the arrows in figure 105, and you'll" get a weird, herring bone skeleton effect as in Fig. 105. This is a very intriguing card trick. A card is selected and placed into the deck by spectator. Then the entire deck is apparently criss-crossed with an elastic band. Performer throws pack of cards on floor or table still securely bound with the crossed rubber band and the selected card is retained, free from the deck in performer's hand. METHOD: Have any card freely selected by spectator. He may initial it for identification if he wishes. Bring the chosen card to the back of deck by the "Hindu Shuffle," a pass or cut. Encircle the elastic band around the width of the deck but buckle back the chosen card so that the band circles all the cards except the selected one. Fig. 106 (see arrow). Then circle the band around the whole deck, crossing the elastic. The front view will look like it appears in Fig. 107. The rear view will look like Fig. 108. There is nothing below the index finger when you display the back of deck but your forefinger extends across the back makes it appear as if there was a strand of the elastic beneath it. Then by merely holding your fingers against the back or selected card you may toss the deck to the floor or table. The chosen card will remain in the hand, the rest of the pack will go to the floor or table still securely bound by the criss-crossed elastic Fig. 109. CHALLENGE INTERLACE INTERLUDE Bet that you can make — an interlaced design of the elastic faster than your spectator can — and you will use only one hand! The elastic is stretched around the right thumb and little finger, spanning the palm Fig. 110. 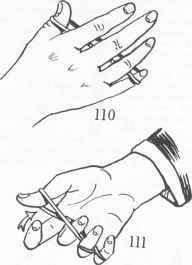 Alternately hook in top and bottom strands of the rubber band with your finger tips — 112 — Fingers go in direction of the arrow. The result will be a perfect interlace as in figure 112 — and it's done more quickly than you can write about it! 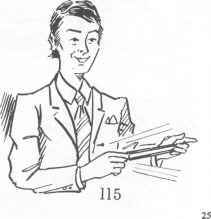 A long elastic (about 8 or 10 inches in length) is threaded through one of the buttonholes of your jacket, as in figure 113. Each end is held by thumb and index of each hand. Viewed from above, as in figure 114, still holding loop "A" with right thumb and index finger, right middle finger hooks into the other loop "B". Both right middle finger and left index finger pull in direction of the arrows, as you release loop "A". The band will apparently pull through the coat at the buttonhole. Fig. 115. 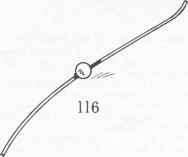 A bead is fastened to the center of a long piece of elastic -— Fig. 116. A card is selected by spectator and inserted in the deck. Get a little finger break in the pack and ribbon spread the deck face down upon the table. You secretly note where the card is either by spreading the cards a bit more at the chosen card, or letting the card before it or after it project a bit more in the ribbon spread. Hold the elastic by one end securely in the left hand, and at the other end in the right hand. Stretch the band, so held in front of the ribbon spread. Secretly and slowly let the right end contract and slip through right thumb and forefinger, but still hold on to both ends. When the bead reaches in front of the selected card tighten your grip on the right end of the elastic. The rubber band with its beady eye found your card! Fig. 117.
BUSINESS CARD PREDICTION To prepare cut a business card more than half its length as in Figure 118. Write a prediction such as a person's name, the name of a playing card, a number or a color, on the blank side of the bottom of a stack of business cards. Place the cut piece of card over the written prediction. The blank side of the piece showing as in Figure 118. Encircle the entire packet of business cards with a wide rubber band as in Figure 119. Covering the cut piece. Have the spectator initial the lower corner of the card as in Figure 119. Force a card or any other prediction you have written in advance upon the spectator. Now turn over the packet in your left hand holding it in the same position as you would for a "glide."' Slide out the initial card with its prediction written on it face down on the table as in Figure 120. Turn over the card and you have the prediction on what was formerly the blank initialed card.